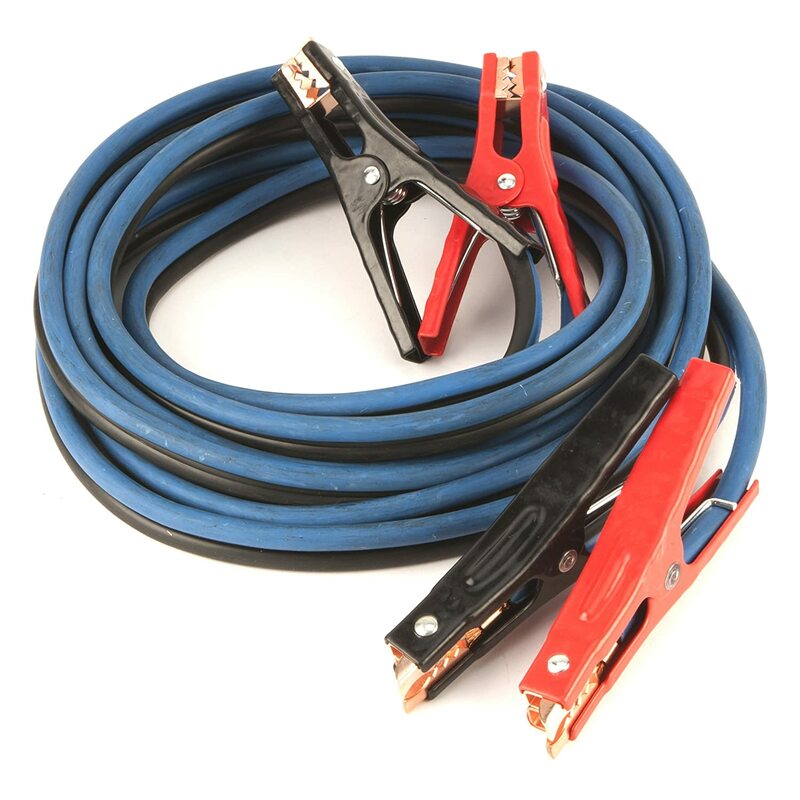 If you own a car then you might need a jumper cable, which is simply a set of two thick wires which offer heavy duty service with alligator clips on both the ends. At one point or the other they will be used to jump start a dead battery of a car. This safety equipment is important in your car and also in your family members’ car. Jumper cables are available in sets of two, a black one which is for the negative side and a red one which is for the positive side. As the two cables are identical, it may become quite confusing and therefore one may interchange them while using. This can prove out to be very harmful for the car batteries so proper care should be taken of that aspect. Looking for them in the store and in the online portals can be a tiresome work and may also prove out to a futile effort if you have no clue of what you need and end up to ch﻿﻿﻿﻿oose wrong jumper cables for yourself. ** Below, you'll find our more detailed reviews by click in "Reviews" column, but you can also click the links above to see current prices or read customer reviews on Amazon. 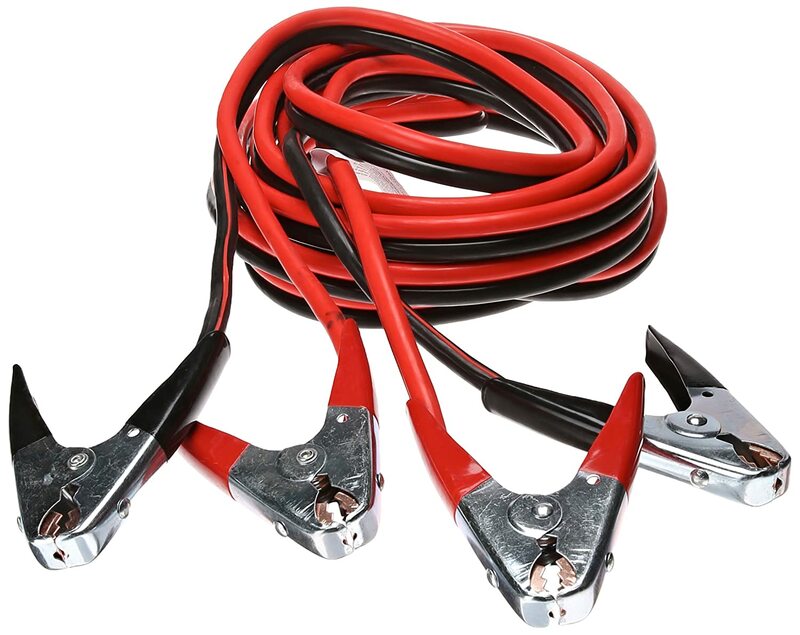 In our article we aim to guide you through all the necessary points that you need to consider while looking at the specifications, so that you purchase the best jumper cables for your vehicle. How To Choose The Best Jumper Cables ? It should be known that the jumper cables which are heavier and thicker conduct more energy than the smaller ones. The small wires are easily available at any departmental stores or even at gas stations which can be bought for a relatively cheap price. These wires are not recommended though and should be avoided. If one owns a SUV or a big truck then a thick wire should be bought so that there is no issue in conducting enough energy to jump a car to start. For a basic need and to cover some regular purpose a length of 12’ length would be good enough. This should be enough to get the battery in both the vehicles. This might prevent you from being stuck in a position where the vehicle needs to be pushed to a distant place. It is said that the lower the gauge, more power goes through it and the faster it charges.10-gauge may prove out to be useless, 8-gauge is considered sufficient enough, 6-gauge is taken to be much better and 4-gauge is something which will be most probably used by you (only if you do not need to jump a semi-truck).Big jumper cables establish a more solid grip for the big alligator clips with which they come along. Always look for a sturdy clamp. And thus it will prove out to stay better than the rest. Clamps with teeth are more assuring as it saves the chances of slipping off at any given time. While buying clamps also look for rubber-coated surface as it gives out less chances of receiving shock. Thicker gauge wires are the prime choice but it can be very deceiving at the same time and same is the case with the ‘heavy-duty’ label on it. One thing which should be done for certain is that the gauge amount can be checked instead. The clamps made with solid copper will transmit better electricity than the ones which are simply copper plated. It so happens that after extreme wear and tear the copper plates may wear off the steel substrate and not transmit electricity. This will ultimately result in your jumper not working fine. Therefore do not prefer cheap clamps as they would offer less transmission of electricity and do change the clamps when they get too old. There is no different consideration to be made regarding this than to the gauge wire. Thicker wires are known to provide better insulation. If one stays in a cold climate, there is a high chance that a cheaper insulation would crack quite easily. Better insulation always retains its pliability no matter how much of coiling or recoiling is done to it while in use. Cheap insulation never straightens out, thus it becomes pretty hard to use. What Else Is Needed For Using A Jumper Cable? If there is no volt meter in the dash gauge of your car then it will a good thing to buy a voltmeter, this is done to get the assurance that the two batteries are properly connected to the jumper cables. If one connection of the car does not seem to jump start then the lead of the voltmeter should be checked to ensure it. An indication of less than 12 volt across terminals means that there is no proper connection between the batteries or the cables are not good enough to provide the required power across battery. Cartman Booster Cable is very easy to use tangle free cable. These have a length of 20 feet and are a thick 4–gauge heavy duty cable. With a width of nearly 10.8 inches and is made of up a material which is sufficient in CCA (Copper coated Aluminum. This product is UL listed and ROHS compliant. Proper insulation is provided by T-Prene coating. The handles and gripping are very firm and they are good to go for a very long span of time. This product is considered to be of very high quality. These cables are so efficient that they can jump start a completely dead battery in a minute. It is a product which has received good reviews not only for its features but also for the very fair price in which it is available. It has earned a name as a good product with a very decent price to go with it. Additional miscellaneous add on products are available with the kit like gloves, steel tool brush, clean battery cables and a bag to pack these all neatly. Powerful rugged clamps grip terminals. 20-foot cable good enough for all jumper application. Some of the plastic and the wire was torn leaving bare wire exposed. 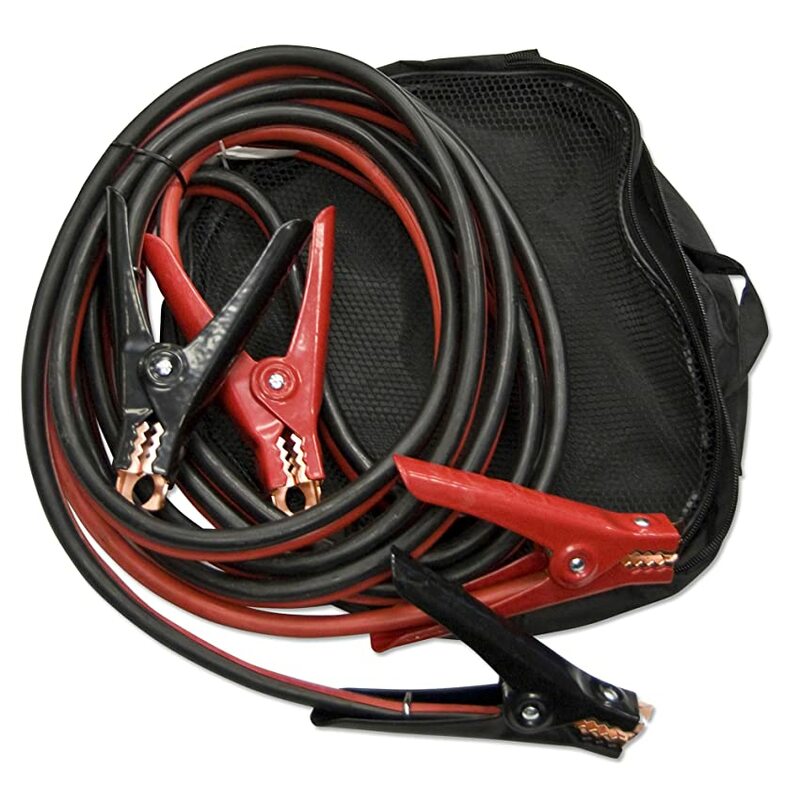 Iron Forge Tools booster cable best fits your need when your car and your vehicle needs the required push to get jump started. This tangle–free color coded cables are very easy to use and helps in running up your vehicle in no time. The length of the cable is 20 feet long with 4-gauge present. The width of the product is 12.1 inches. The material of the product is copper coated aluminum CCA. The contact clamps are strong and very well built to last. These solid formidable cables come very well packaged. They include all that requirements which are needed. 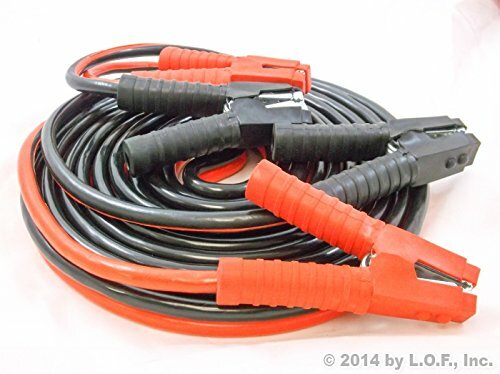 These long lasting jumper cables with such a sturdy strength to go with, has a very good price to lay down for its customers. 20 feet cable is its superior feature along with being quite heavy duty. The clamps are heavy and grips very securely. The shipping arrives right on time and very fast. The AAA booster cable can charge up dead batteries in a matter of seconds. The cables are 16 foot long and great for the work of heavy-duty. The 6-gauge wire is efficient in giving 100 per cent more power than light duty cables. It comes in color coded form and has a width of 13 inches. The clamps close up very tightly and hence there is immense security. The insulation of AAA jumper cable has rubber type insulation. These long and sturdy cables come at a very good price. This is the most sorted product which offers great performance and is cheap at the same time. It portrays a union of great quality and a reasonable product. Cables are long and heavy duty. Clamps have a weird prong at the tip which is good for small battery terminals. Cable comes with a nice pouch and zipper. Weak connections at first, sometimes it even leads to no connection. Coleman cable is known for its exclusive efficiency as heavy duty auto battery booster cables which have a 4-guage. The cable is available in 4 sizes of 12 feet, 16 feet, 20 feet, and 25 feet. The no tangle cable is insulated by a T-Prene coating, which provides flexibility and gives us easy storage. The clamps have a feature of triple-polarity which is color coded and is marked with glow in the dark labels. This versatile and the easy to use conductive clamp surface are recessed to prevent accidental contact. The ergonomically made design makes it really easy for people to use it and so is the handling. This cable is very much suitable for warm and cold climate. This is a good product and is available at a very decent price. Quality cables for the money. Solid construction, a nice thick gauge. Clamps are very secure with no tangle. Description is over leading, it is an inferior product. 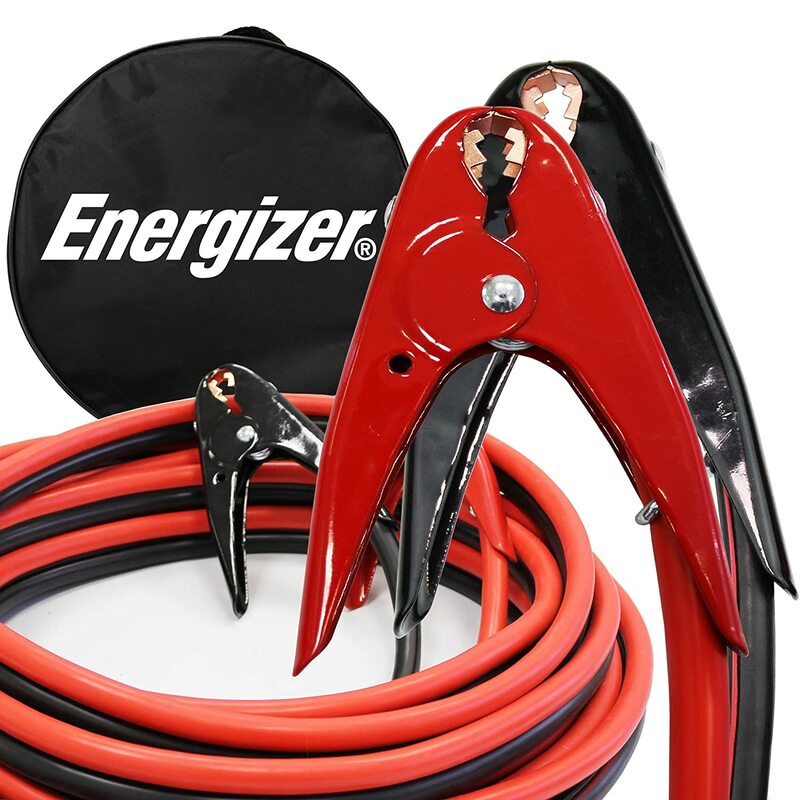 This 1 gauge long jumper battery cable from Energizer is the most convenient option in case of jump starting a vehicle. The long cable of about 25’ allows the user to connect the cable in the car even from backside in order to jump start the battery. Along with being convenient length wise, this jumper battery cable also offers a number of other features that can be also taking as the pros of the cable. The cable is made of industrial level copper and aluminum for better working. The cable remains flexible at the temperature of 40 degrees also. The clamps are PVC coated to protect you from shocks. The cable has a capacity of 800 Amp. One of the most important cons of the jumper battery cable is that the capacity of current flow is much lesser than the pure copper cables. Also the clamps may get sometimes twisted. This is an extra long cable for better convenience while jump starting the car battery. Not only the cable is long in its dimensions but also it is made in such way that it is absolutely tangle free. The jumper cable comes along with various numbers of advantages for the vehicle and also for maintenance. The 2 gauge cable is not only good for its length but also for its heavy duty property. It features parrot jaw clamps of 600 Amp. The cable is flexible at both the extreme temperatures and hence is highly weather resistant. It suits both 12 volt as well as 24 volt system. Apart from the time consumption in case of a large battery, there are no such other disadvantages of the jumper cable that has been found yet. Even the customer reviews are also quite satisfactory. The cable is of about 4 Gauge that is about 20 foot. The 500 AMP battery cable is of high duty and is perfect for heavy vehicles such as truck, SUV and van. It is due to its heavy duty that it is mainly used by the owner of the heavy vehicles only. The cable features rubber coating that makes the cable absolutely tangle free. Thus, you can easily fold it to keep it in the car and can anytime take it out and use it easily. The colors of the clamps has been colored in clean and sharp colors red and black so that there is no confusion at all in identifying them. The copper jaw clamps are of course heavy duty and is also fast in transforming the energy. This particular cable is a bit heavier than any other cables. Also it takes more space than any other cables. The jumper cable measures as much as 20 foot long or 4 Gauge. It is high in performance due to its number of features. Being one of the best jumper cables, it comes along with a number of advantages. This pros not only make it high performance but also highly reliable. The cable is made up of a material that is extra durable and hence the cables are known to survive for quite long time. The copper jaw clamps are high in grip for better performance. The clamps are coated with strong colors of red and black for better identification even from far. The cables are made of rubber and hence are tangle free, even if they are folded. Till date there have been no such disadvantages that have come up with this jumper cable. This is the reason why the brand has a money back guarantee on the product. The brand FJC brings in the model 45255 battery booster cable with various features and a huge number of benefits. 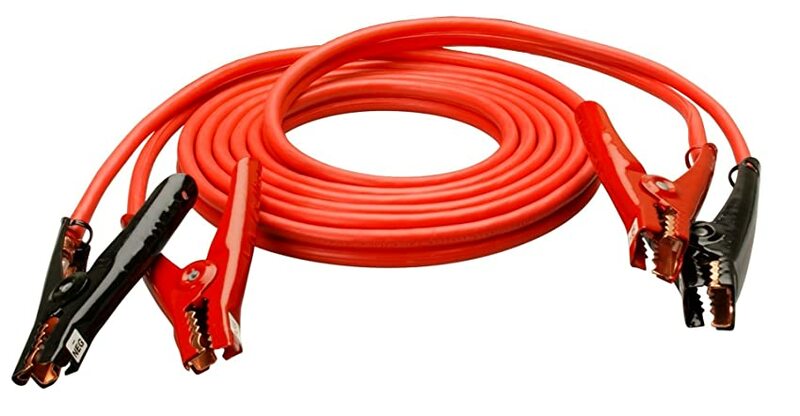 The cable is available in 1 Gauge size and is average enough for a car battery to get jump started during an emergency. The cable can be used for both personal as well as commercial use. It is capable of holding about 800AMP energy capacity. 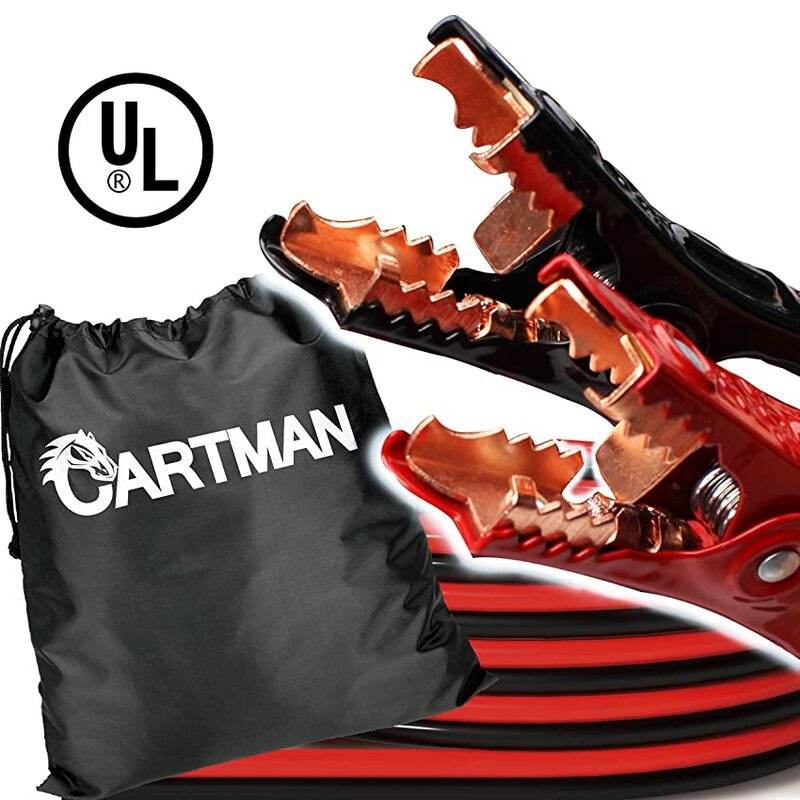 It features jaws that are of heavy duty and hence they are safe to be used. The cable is absolutely free of any kind of tangles. The cable is available at a cheap price in comparison to any other booster cable. There are no such disadvantages of the booster cable yet. Still to name one, it can be said that the cable is not much resistant to a very high or a very low temperature. 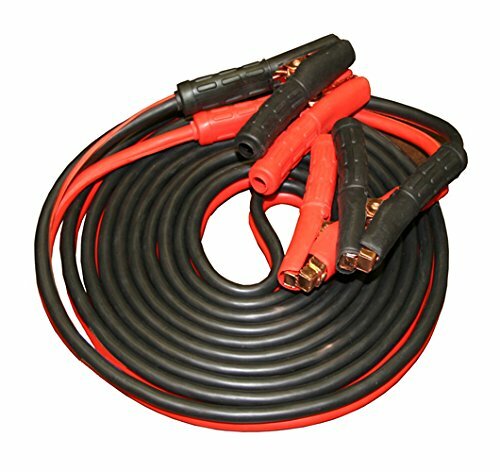 If you are searching for a cheap priced yet reliable jumper booster cable, then this can be a choice of yours. 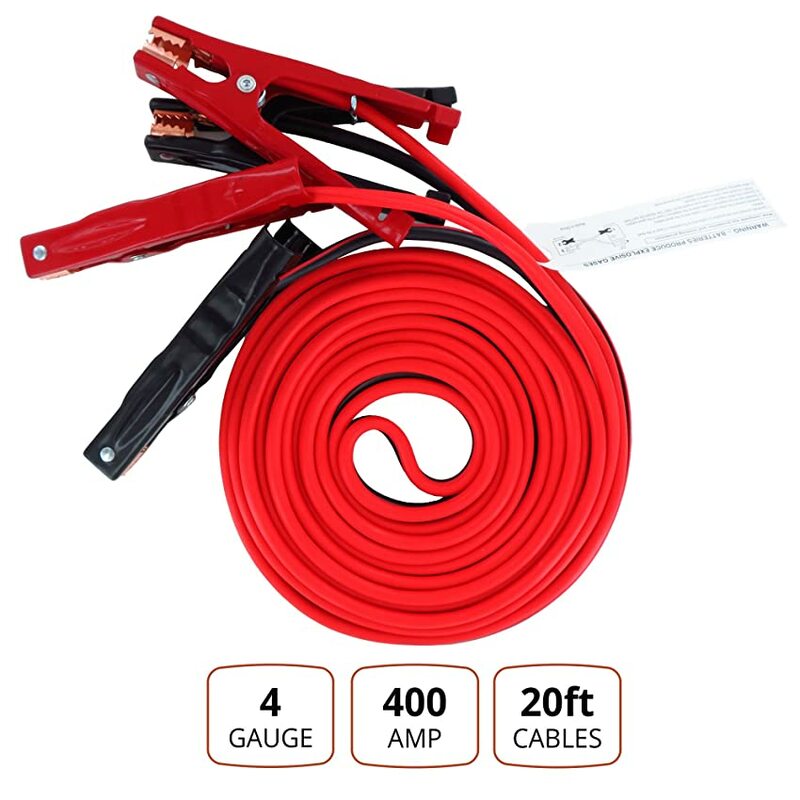 This 1 Gauge cable provides you with the best features and also a number of pros to make your experience hassle free and a convenient one every time when you jump start your car battery. The 1 Gauge cable cover is made up of industrial materials to provide quality thickness. The main cable is made of copper clad aluminum that is of high quality. The cable comes along with a case that is handy and also at the same time is portable. The cable is known for faster boosting and for high conductivity. One of the very first disadvantages can be that the cable cannot be used for commercial use. The case may not be of much use for many. Are there any significant and practical differences between different materials in jumper cables ? The cheap available jumper cable are said to be clad with copper. This means that jumper cables are made of aluminum mostly with a very thin copper coating on the outside. More than 99% of the wire is aluminum. Copper wires are preferred over other copper clad version because of its durable nature while the aluminum one corrodes over time. This is not likely to happen with the better priced copper ones. How do I determine what kind of gauge wire I need ? It is seen that larger the gauge the more numerically low it is in number , hence it will have long cable lengths .This allows you to connect one battery to another more easily in various situations. Is there a very important consideration which should be made while buying a set ? It is recommended by experts to get at least 4-gauge one. This is because when the vehicle starts, the alternator produces a lot of power which keeps the vehicle running irrespective of the condition of the battery. If you happen to come across a vehicle which is completely dead and with not much power to get that started then a 4-gauge one gets your vehicle started with no difficulty. Then the alternator should continue to charge the battery while the vehicle is running. This cable functions much better than 10-gauge or 12-gauge cable, as they are unable to give enough amps. It will be very frustrating to have a battery in your car go dead when you are stranded in the middle of nowhere, and with the misery of having no jump cable to revive the life of the battery. Therefore, always keep a jumper cable with you and let us know how you found our guide on choosing the best jumper cable for your convenience. Thanks for reading this article, if you have any further queries then you can comment below and will be back with providing you answers in due time.Finally, just grab a long heavy gauge, well insulated jumper cable and keep it in your vehicle, you never know when you might actually need it!